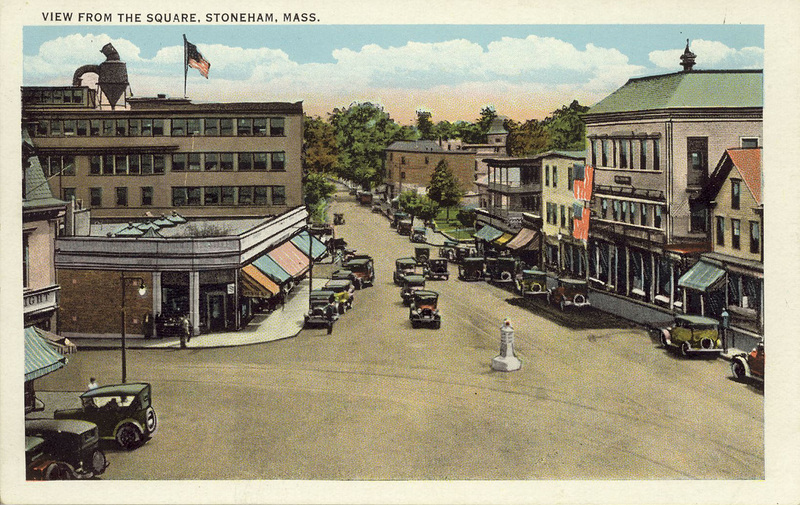 Stoneham Square is now the heart of Stoneham, but was not its original town center, which was near Spring and Pleasant Streets. The town shifted west after the opening of the Medford-Andover Turnpike (now Route 28/Main Street) in 1806. For your first stop on the tour, notice the three major buildings that surround Central Square. They are typical examples of mid- to-late 19th center commercial architecture and were all built at a time of considerable prosperity in the local shoe industry. The Dow Block in the center was built by Charlestown investor Moses Dow in 1864 and once housed the post office, the library and was the headquarters for the Grand Army of the Republic, a Civil War veterans association. . The Dow Block replaced the 1806 Gerry’s Tavern, built when the turnpike was new and was only structure here in Central Square in a 1830 map of Stoneham before Franklin Street was even laid out. Notice the central dormer of the Odd Fellows Hall on the corner of Franklin and Central, built in 1870, with the date of purchase by the IOOF from Isaac Hersam in 1878. The Chase Block, the red brick building on Main Street, is the newest of the three, constructed in 1874 by the Chase brothers, two local grocers. Over the years it has housed small shoe manufacturing concerns, banks, shops and offices. You can also see the police box now in front of the Odd Fellows Hall, in its original location in the middle of the square in the photo at the top of the page. For over 40 years, the original Police Box stood in the center of the square and was used to regulate the traffic lights until it was destroyed in a car accident in 1983. On July 13, 2009 a ribbon cutting ceremony was held to dedicate the new Police Box replica. This is a view from the Dow Building looking south. 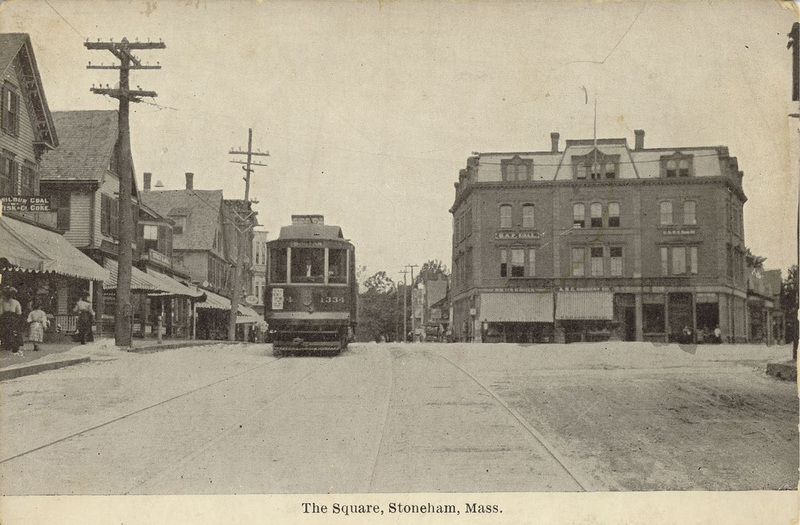 Before you leave Stoneham Square, look south on Main Street. The large green building on your left, now condos, was once the large Hill shoe factory and later Mann Shoes and Stone & Forsyth box factory. 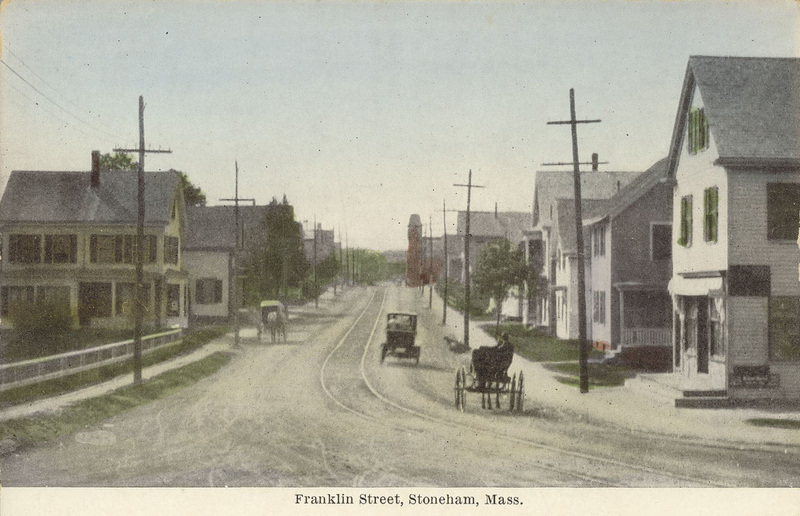 The shoe industry employed over half of all Stoneham's workers in the 19th century. You can learn more about the shoe industry on the next stop. ﻿﻿ The Eastern Street Railroad once ran multiple lines in Stoneham. The main branch ran from Elm Street south along Main Street towards Medford and on to Sullivan Square in Charlestown. Other branches ran along Elm, Franklin and Marble Streets and along Montvale Avenue. ﻿Next you will walk down Franklin Street toward your next stop: the Fuller House. The photo below shows the street in the late teens, with streetcars, early autos and horse-drawn buggies all sharing the road.